Berrima District Museum, Berrima, Australia. 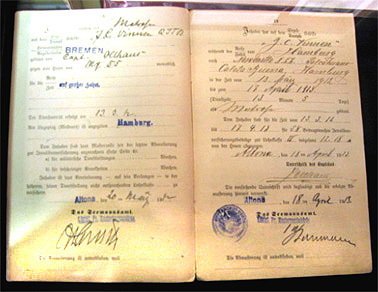 German Merchant Officer’s Service Record Book. The book is made from white paper with a dark red cardboard cover. It is printed in German. It belonged to Wilhelm Köster and contains a record of the ships on which he served from 4 May 1909 to 8 June 1915. Dimensions: 133mm wide x 205mm high x 6mm deep. The outbreak of fighting in Europe in August 1914 immediately brought Australia into the Great War. Within one week of the declaration of war all German subjects in Australia were declared ‘enemy aliens’ and were required to report and notify the Government of their address. In February 1915, enemy aliens were interned either voluntarily or on an enforced basis. In New South Wales the principal place of internment was the Holsworthy Military Camp where between 4,000 and 5,000 men were detained. Women and children of German and Austrian descent detained by the British in Asia were interned at Bourke and later Molonglo near Canberra. Former jails were also used. 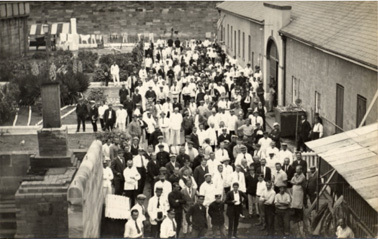 Men were interned at Berrima Gaol (constructed 1840s) and Trial Bay Gaol (constructed 1889). At these camps the internees organised themselves into arts and craft societies and organised large German events and festivals to pass their time and to retain a sense of community. Like the internees of Trial Bay these activities provided a distraction to camp life and reinforced a sense of their own cultural identity. But unlike the Internees at Trial Bay, who considered themselves among the top 500 of the German elite in New South Wales, the Berrima internees were seamen, some of whom who had served time on the windjammer clippers and were used to long periods away from home and music was very much a group activity appreciated by them. The internees were allowed a large degree of freedom and self organisation by the Camp authorities. The majority of the internees were crews from German merchant ships captured in Australian ports at the outbreak of war such as the Pfalz, Elass, Berlin, Prinz Sigismund, Hobart, Tiberius, Turul and Germania. Later the men were prisoners of war from German colonies and bases in the Pacific and the crew from the German light cruiser SMS Emden sunk off the west Australian coast by the Australian cruiser HMAS Sydney in 1914. The regimented and structured nature of mercantile culture resulted in the Berrima internees being largely self-regulating and self-managing. The Service Record book belonged to Wilhelm Köster a 19 year old who was on his first commission on the Pfalz, a freighter of the North German Lloyd Line when the ship was seized in Melbourne at the start of the war. The Pfalz has the distinction of being the vessel to draw the first Australian cannon shot of the war. When on the routine a departure after unloading cargo at Melbourne the bug gun at Fort Nepean fired a shell just astern as a warning shot. Naval officers boarded the vessel and ordered Captain Wilhelm Kühlken to return to Melbourne. The Pfalz and was captured in Melbourne on the 5th August 1914, renamed SS Boorara and converted for Australian defence transport uses. She was rammed by the French cruiser Kleber on the 17th September 1915, torpedoed in the English Channel in March 1918 and torpedoed again near Yarmouth on 23rd September 1918. 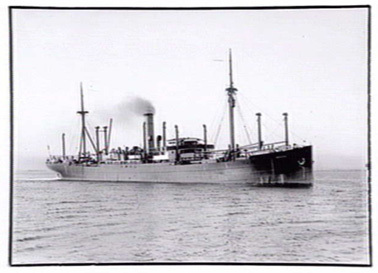 Boorara survived the war and on 24th June 1919 she was transferred to the Commonwealth Government Line. The crew of the Pfalz were interned and sent to Berrima in 1914. Köster was involved in boat building and theatre at the Berrima camp. Köster and friends built a large boat for the Berrima River water sports and many regattas called Attila (the Hun) that was reliable and long lived. Köster’s years of training and his few months on the Pfalz made up his entire maritime career. After his repatriation 1919 he found, as was common among many of the Berrima internees, little prosects of an immediate return to a maritime career because of Germany’s decimated mercantile fleet and takeover of German markets by allied companies. 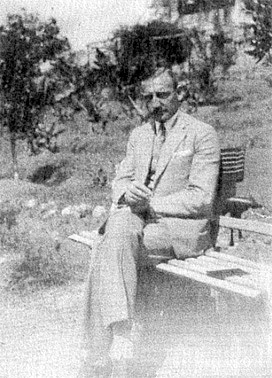 Köster turned to industry where, because of his fluency in English was appointed English language correspondent for the Excelsior Tyre Company of Hannover in 1920 where he travelled extensively between Germany and North America. He married in 1921. In 1932, he became the manager of the technical division of the Hamburg Branch of the Continental Tyre company which he held to his retirement in 1960. Köster died in 1969 being survived by his widow and three daughters. Köster was never to return to Berrima but was a long time member of the Berrimaner Stammtisch, the ex Berrima internees club in Germany. The Service Record Book is a part of a collection of objects integral to the fabric of the Berrima Gaol heritage site and provides the distinctive character of the place. Its primary significance lies in its relationship to the themes of wartime internment experience, racial antagonism and fear of subversion and Australia’s links to and following of Britain’s wartime foreign policies after Federation. The Collection interprets the story, and provides evidence of the experience of the German internee’s life at Berrima Gaol, the attitudes of the German internees to the war and internment and their relationships to other German communities in New South Wales both interned and free.The Service Record Book provides a research tool for historians to explore the First World War chapter of Australian history and give the story a wider meaning in the context of the history of migration and settlement of Australia. The material culture of the Berrima Internee Collection reveals the diverse skills and backgrounds of the people interned there, including their educational and cultural background. Members of the Berrima internee community included ships officers, engineers, navigators and merchant seamen. There is substantial social value in the object as material culture and fabric of a site associated with internment. Internees and guards families have a common link to the place and many local residents have developed a strong attachment to the place. Many local residents are collectors and amateur historians carrying out many years of research and documenting the history of the site and the Collection. A lot of information still resides in the memories of the Berrima community. The place is a focal point for both Australians of German descent and visiting German nationals. The Service Record Book’s provenance is strong. This Service Record Book, now on display in the Berrima Museum, is the one owned by Wilhelm Koster an internee at Berrima and was donated to the Society by Dr John Simmons. The Berrima Internment Collection is rare in that it relates specifically to the German internee occupation of the site and it is associated with people who emerge as significant participants in World War I Australian internment camp history. The Service Record Book represents the mercantile culture and traditions of the German internees. It bears the record of the ships Wilhelm Koster served on prior to internment in 1915. This object shows a strong eye for accuracy and detail and a represents a symbol of German internee’s patriotism and defiance as prisoners. The Service Record Book, as part of a larger collection, represents the German experience in Australia during World War I and Australia’s strong historic links to Britain and the adherence to British foreign policy after Federation. The Collection represents Australia’s fear of subversion during the war and racial antagonism to cultural minorities in war time. The Collection represents a time when Australia still looked to Britain for foreign policy and held deep suspicions of non-British immigrants. The condition of the book is good. It is significant that such an object remains in good condition at the place where it has an historical association with. The Book’s importance lies in its potential to interpret the place a site associated to internment, the internment camp itself and the experience of German communities. The Collection presents the opportunity to interpret the stories of various individuals who were interned at Berrima Gaol and those who returned to Germany after the War only to return as immigrants and become successful members of the Australian community despite their experiences. 1 Simons, J 1999, Prisoners in Arcady, Bowral. p.44. Simons, J 1999, Prisoners in Arcady, Bowral. Migration Heritage Centre & Dept Conservation & Environment. Fischer, G W 1989, Enemy Aliens, Queens land University Press.